Day six of the Olympic games in Rio de Janeiro was full of plenty of historic moments in swimming, rugby and gymnastics. Take a look at the four buzziest moments as part of Adweek's daily social recaps with data from social media analytics company 4C. The data crunches total likes, retweets, mentions and comments across social media. U.S. gymnast Simone Biles not only won over TV audiences with her incredible signature move—she's also blowing up social media. 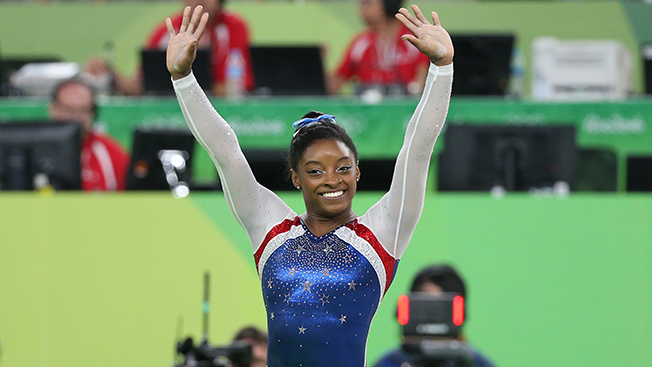 After helping lead the U.S. gymnastics team to a win against Russia on Tuesday, Biles won the gold medal in the individual all-around competition on Thursday—netting 494,982 social engagements. With two gold medals already, Biles will compete for three more in high-profile competitions, with many speculating that she'll leave Rio de Janeiro with five gold medals—making her an Olympic great. American swimmer Simone Manuel and Canadian Penny Oleksiak tied for a gold medal in the 100-meter freestyle, with 20-year-old Manuel becoming the first African-American woman to win the award on Thursday. Sixteen-year-old Oleksiak, meanwhile, became the first swimmer born in the 21st century to win a gold medal. The tie racked up 429,008 interactions across the social web. Swimming events in general have kept social media buzzing this week, with big wins by the U.S. teams. Led by Osea Kolinisau, Figi's rugby team won the country its first-ever medal—in gold, no less—over Great Britain in the sevens final yesterday. The event generated 387,179 social engagements and caused residents on the South Pacific island nation to close restaurants and shops to tune in for the country's historic moment. This year's games also mark a return for rugby, which has not been included as a sport since 1924. For his last Olympics games, U.S. swimmer Michael Phelps has already grabbed lots of social media buzz in the first week, and yesterday was no exception. The 31-year-old Olympian won his 22nd (and fourth from this year alone) gold medal during the 200-meter individual medley—a race including all four swimming strokes: Freestyle, butterfly, backstroke and breaststroke. The win marks Phelps' 13th individual gold medal, breaking a 2,160-year old record for most individual win previously held since the Ancient Games by Leonidas of Rhodes. Thursday's event netted 341,933 social engagements, per 4C.